The review of the literature was done in the search for the Medline (PubMed), Embase and Cochrane databases including studies published until June 2018. The Prisma was used for the systematic review and the articles were evaluated according to the levels of Oxford evidence. Ten recommendations were developed addressing the management and therapy of systemic autoimmune myopathies. Robust data to guide the therapeutic process are scarce. Although not proven effective in controlled clinical trials, glucocorticoid represents first-line drugs in the treatment of SAM. Intravenous immunoglobulin is considered in induction for refractory cases of SAM or when immunosuppressive drugs are contra-indicated. Consideration should be given to the early introduction of immunosuppressive drugs. There is no specific period determined for the suspension of glucocorticoid and immunosuppressive drugs when individually evaluating patients with SAM. A key component for treatment in an early rehabilitation program is the inclusion of strength-building and aerobic exercises, in addition to a rigorous evaluation of these activities for remission of disease and the education of the patient and his/her caregivers. Systemic autoimmune myopathies (SAM) are a heterogeneous group of autoimmune diseases associated with high morbidity and functional disability . Considering its epidemiological, clinical, laboratory and histopathological features, SAM can be classified as dermatomyositis, juvenile dermatomyositis, clinically amyopathic dermatomyositis, polymyositis, inclusion body myositis, immune-mediated necrotizing myopathies and cancer-associated myopathies [1, 2]. Treatments of SAM include not only inflammatory process suppression, but also prevention against musculoskeletal tissue and extra-muscular organ damages. However, robust data are scarce and the therapeutic process is based mainly on observational studies, retrospective analysis and/or small samples of patients [3, 4]. Therefore, the purpose of these recommendations is to guide the treatment of adult patients with SAM, highlighting dermatomyositis and polymyositis, according to current evidence in the literature, facilitating access to available therapies and minimize irreversible disease damages. A systematic literature review was performed with the following databases: Medline (Pubmed), Embase and Cochrane. The research strategy was performed according to each “PICO” question (Patient, Intervention, Control and Outcome) elaborated by rheumatologists with experience in the treatment of SAM. The following English terms were used in the systematic review of the literature: (Muscular Disease OR Myopathies OR Muscle Disorders OR Muscle Disorders OR Myopathic Conditions OR Myopathic Conditions) AND (Autoimmune OR Autoimmune Disease OR Autoimmune Diseases OR Systemic OR Polymyositis OR Idiopathic Polymyositis OR Idiopathic OR Dermatomyositis OR Dermatopolymyositis OR Dermatopolymyositis OR Myositis OR Inflammatory Muscle Diseases OR Inflammatory Myopathy OR Inflammatory Myopathies OR Inclusion Body Myositis OR Inclusion Body Myopathy, Cyclosporine OR Cyclophosphamide OR Methotrexate OR Azathioprine OR Infliximab OR Tumor Necrosis Factor - alpha AND (Therapy / Broad [filter]). With the application of the random filter, the terms related to each modality of induction treatment for patients with SAM were added. Inclusion criteria for studies in this systematic review were: randomized and controlled trials (RCTs) addressing SAM treatment, extension studies made from RCTs with the criteria mentioned and systematic reviews with RCT meta-analyzes. In some cases, historical cohort studies and review articles were included and, in the absence of RCTs for specific modalities of therapy, open studies or low quality cohort studies were included. The steps in this systematic review of the literature followed the Prisma guidelines . The selected studies were evaluated and the degree of recommendation for each question was based on the level of evidence from the studies (Tables 1 and 2) [6–8]. Ten recommendations were developed to address different aspects of SAM therapy (Table 3). 1. What are the general and educational recommendations for SAM? 2. What are some precautions before immunosuppression in patients with SAM? 3. What treatment is recommended in the initial phase of SAM? 4. Which drug treatments are recommended for refractory SAM cases? 5. What initial dose of glucocorticoids should be used and for how long in patients with SAM? 6. How long should SAM patients receive immunosuppressive / immunomodulatory drugs after discontinuation of GC? 7. What is the evidence on the benefit of immunosuppressive / immunomodulatory drugs association (association versus exchange) in SAM? 8. What is the role of rehabilitation, physical exercise and physiotherapy in the treatment of SAM? 9. How to monitor disease activity (biomarkers) in patients with SAM? 10 How to define activity versus remission of SAM in clinical practice? What are the general and educational recommendations for SAM? Literature review and analysis. In general, the education of individuals with SAM, as well as their families and/or caregivers, is of great importance, since they are looking for environmental adaptations and implementation of rehabilitation programs aiming to maintain/improve the patient’s quality of life. Immunodeficient patients due to the use of medications should be advised about hygiene, maintenance of good nutritional status, avoidance of vaccines with live infectious agents and contact with infectious contagious diseases (B) . When pulmonary dysfunction results from weakness of the diaphragmatic muscles and thoracic muscular wall, respiratory rehabilitation (kinesiotherapy) may be indicated to reduce dyspnea and increase exercise capacity (B) . In case where muscle weakness at the level of the upper third of the esophagus leads to dysphagia, regurgitation or aspiration, dietary changes and swallowing training may be employed. In selected cases, cricopharyngeal myotomy and botulinum toxin application may be necessary (B)  (C) [11, 12]. In more severe patients a nasogastric tube or gastrostomy feeding may be recommended to reduce the risk of aspiration and pneumonia (C)  (D) . What are some precautions before immunosuppression in patients with SAM? Literature review and analysis. Glucocorticoids (GC) affect the adaptive and innate immunity processes and increase the risk of acute infections and reactivation of chronic infections caused by fungi, bacteria, viruses and parasites, which can lead to serious disseminated diseases (B) . In addition to specific prophylactic and vaccine recommendations, the use of antibiotics at the first signs of bacterial infection is required (B) . Pneumonia by Pneumocystis jiroveci is a complication in immunocompromised patients and is seen in individuals submitted to high doses GC or other immunosuppressive treatments (B) [15, 16] (C) [17, 18]. 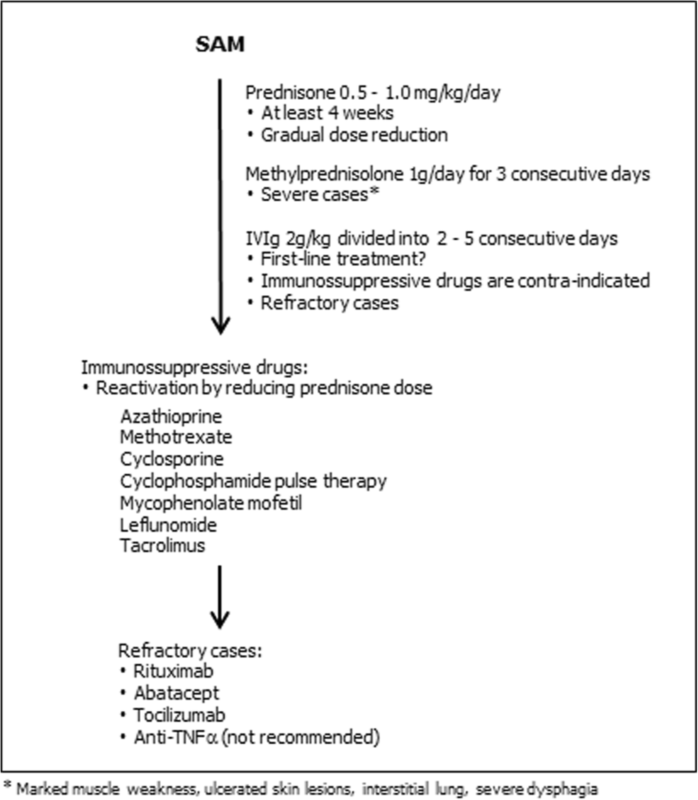 Despite the controversies and lack of available evidence, prophylaxis for pneumocystosis should be considered, particularly in the presence of risk factors (e.g., interstitial lung diseases - ILD, other immunosuppressive drugs, patients with anti-MDA-5), for patients who use ≥20 mg/day of prednisone or its equivalent for a period of more than four weeks (B) [19, 20] (D)  (C) [22–24]. Due to the risk of reactivation of latent tuberculosis, patients undergoing immunosuppressive therapy who present a positive tuberculin test (≥ 5 mm), even with a chest X-ray without evidence of a cicatricial lesion are candidates for prophylaxis (C) . Doses equal to or higher than 15 mg/day of prednisone for a period of more than one month or another immunosuppressive therapy are considered as a risk for the progression of tuberculosis from its latent form to the active form (B) [26–28]. Screening for exposure to tuberculosis, as well as obtaining the patient’s medical history, can identify risk factors such as contact with an infected person, residence in an endemic area or abuse of illicit substances. In these individuals, prophylaxis with isoniazid should be considered at a dose of 5 to 10 mg/kg per body weight (maximum dose of 300 mg/day) for 9 months . In immunosuppressed patients, an infestation caused by Strongyloides stercoralis is associated with a high mortality rate even years after exposure (B) . Screenings should be considered in patients with risk factors (e.g., travels to or inhabitants of endemic or high incidence areas of the disease) and who are initiating therapy with immunosuppressive drugs such as GC. Although there is no evidence guiding the prophylaxis of strongylodiasis, ivermectin with immunosuppressive drugs and pulse therapy with methylprednisolone prior to the start of treatment is considered in endemic areas (A)  (D) . Immunosuppressive drugs may lead to a lack of vaccinal immune response or the development of active infections when exposed to vaccines consisting of live attenuated viruses. At the moment, there is no solid evidence on the recommendation of the vaccine process of immunocompromised individuals, but for those requiring high doses of GC (≥ 20 mg/day of prednisone or its equivalent for more than two weeks), vaccination is recommended for Haemophilus influenzae type B and the hepatitis A and B, human papillomavirus, influenza, Neisseria meningitidis, measles, mumps and rubella, Streptococcus pneumoniae and tetanus (B) [33, 34]. Individuals who have not received the updated vaccines should receive the vaccine prior to taking immunosuppressive drugs, especially those composed of live viruses due to its contraindication during immunosuppression (D) [35, 36]. Due to the lack of data, specific recommendations guiding the start of treatment with immunosuppressive drugs after immunization with live-attenuated virus vaccines vary. A minimum waiting period of two to four weeks, an estimated time to allow the establishment of an immune response and elimination of live viruses, is advocated (A) . Vigorous hydration to increase urine output and intravenous 2-mercaptethane sulfonate (MESNA) were recommended for prophylaxis of cyclophosphamide-induced hemorrhagic cystitis (C) . Patients should be assessed for fracture risk and bone preserving agents and be prescribed calcium and vitamin D supplementation (B) . Bisphosphonates remain the first choice of treatment in GC-treated patients with high fracture risk (A) . What drug treatment is indicated in the initial treatment of SAM? Literature review and analysis. Although they have not been tested in controlled clinical trials, GC represent first-line drugs in the treatment of SAM with recommended initial doses of 0.5 to 1.0 mg/kg/day of prednisone for at least 4 weeks (C) [41–43]. (Fig. 1). However, depending on the severity of the disease, lower doses, which are associated with fewer adverse events, can be used. In severe cases, such as patients with marked muscle weakness, ulcerated skin lesions, ILD and severe dysphagia, the use of intravenous methylprednisolone (MP) pulse therapy (1 g/day for three consecutive days) followed by a high dose of GC via oral route should be considered (C)  (B) . There have no sufficient studies showing the appropriate timing for initiating GC. However, it is possible that an early drug intervention allows a rapid remission of the disease, a lower frequency of relapses and/or a good prognosis of MAS (C) [45, 46]. Moreover, the GC treatment should not be postponed in order to perform an appropriate investigation (e.g., muscle biopsy) (C) [47, 48]. Of note, GC use does not influence the presence or the degree of inflammatory cell infiltration found in muscle biopsies in dermatomyositis / polymyositis with clinical and laboratory disease activity (C) [47, 48]. GC typically results in the normalization of serum levels of muscle enzymes and clinical improvement in muscle strength. However, more than half of patients (B)  do not present a complete response to the use of these drugs, and several factors may contribute to response to treatment including disease subtype, onset of therapy, antibody profile or the presence of cancer . Patients with a long period between the muscle symptoms onset and the institution of drug treatment are less likely to present a complete response to GC (B) . Among those who do not present clinical improvement with GC, the reassessment of the diagnosis, the development of myopathy induced by the use of GC or the appearance of malignancy should be verified (D) . For those who present reactivation of the disease by reducing GC doses, methotrexate, azathioprine and/or cyclosporine are the most frequently used in clinical practice, despite the absence of controlled trials evaluating their efficacy (B) [44, 51–55]. The use of intravenous immunoglobulin (dose of 2 g/kg divided into 2 to 5 days) is considered for refractory cases of SAM or when immunosuppressive drugs are contra-indicated, such as during of an infectious process (B) . Evidence, however, on the efficacy of intravenous immunoglobulin as first-line treatment of SAM is controversial (B) [56, 57] (A) . What are the recommended drug treatments for refractory SAM cases? Literature review and analysis. Patients with SAM who failed conventional therapy were treated with oral tacrolimus (0.075 mg/kg/day) and showed an improvement in muscle strength, a reduction in levels of CK and a mean dose of GC (C) . Case reports have demonstrated favorable results for cyclosporine use (mean dose of 3.5 mg/kg/day) in refractory SAM patients which an improvement in serum levels of CK and muscle strength (C) [60–63]. Intravenous cyclophosphamide pulses in patients with refractory SAM result in improved muscle strength (C) [64, 65]. In addition, it is possible that its association with methotrexate normalizes the serum levels of CK (C) . Mycophenolate mofetil (1.0 g to 1.5 g twice a day) may be an effective GC-sparing therapy for the treatment of some patients with SAM . This response was based on an improvement in skin disease as judged clinically, an increase in strength and/or an ability to decrease or discontinue concomitant therapies (C) . Leflunomide appears to be effective and safe as an adjuvant drug in refractory dermatomyositis with primarily cutaneous activities (C) . Intravenous immunoglobulin, alone or in combination with immunosuppressive drugs, has a good therapeutic response, mainly in refractory cases (C)  (B) [69, 70]. Clinical trials analyzed patients with refractory SAM treated with anti TNFs [71–73]. Among the patients who completed the study, there was no improvement in muscle strength . In fact, some patients presented an exacerbation of their disease, elevation of muscle enzyme levels, unchanged rashes  and no significant treatment effect on functional outcome . Thus, the use of anti-TNFs are not recommended. A phase IIb clinical trial evaluating the efficacy of abatacept in patients with refractory SAM demonstrated few serious adverse effects in approximately half of the patients’ responses based on the criteria established by the International Myositis Assessment and Clinical Studies Group (IMACS) (B) . Tocilizumab demonstrated efficacy in reports of patients with refractory polymyositis, with a normalization of CK levels, resolution of muscle inflammation in magnetic resonance imaging and reduction of GC doses (C) . Although numerous reports and case series have demonstrated the beneficial effects of rituximab, experience in refractory SAM is still limited (C) [77–81] (B) [82–84]. A multicenter clinical trial known as the “Rituximab In Myositis” trial did not reach its primary endpoint (response in the 8th week in the group treated early in relation to the late intervention group), but in the 44th week of follow-up, the majority of patients (83%) reached the definition of response to treatment based on the criteria established by the IMACS . In this study, serious adverse events attributed to rituximab were observed, most of which were represented by infections (B) . Reanalysis of the data obtained in this study was conducted, and individuals who were positive for the anti-synthase and anti-Mi-2 autoantibodies presented better clinical responses (B) . A multicenter phase II study evaluated the efficacy of rituximab in individuals with SAM with anti-synthetase autoantibodies refractory to conventional treatment (GC and at least two immunosuppressive drugs) demonstrated that the majority of these patients had an increase in the Manual Muscle Testing (MMT)-8 followed by a reduction of CK levels and a reduction in the dose of GC (B) . What initial dose of GC should be used and for how long in patients with SAM? Literature review and analysis. With different regimens of use and routes of administration, the generally recommended starting doses of prednisone, or its equivalent, range from 0.5 to 1.0 mg/kg/day given in divided doses, daily or every other day (C)  (B) [89–91]. Although there are no controlled clinical trials evaluating the optimal rate of GC reduction, dose reduction should be based on the activity of the disease and the presence of extra-muscular involvement (B) [89–91]. Studies have indicated the maintenance of the initial dose over a period of 4 to 8 weeks with monitoring of serum CK levels and muscle strength in addition to other disease manifestations [41, 92, 93]. After this period of time, as long as the disease has been controlled, GC dose can be reduced by 20 to 25% every four weeks until the daily dose of 5 to 10 mg is reached, at which point a stable dose of GC is maintained for another year, depending on the clinical course (C) [41, 92, 93]. In severe cases, MP pulse therapy should be considered (1 g/day for three consecutive days followed by a regimen with oral GC) (C) [41, 42, 92, 93] (B) [41–44, 49, 93, 94]. Although it is considered a first-line drug, studies have shown that more than half of the patients fail to obtain a complete clinical response to CG in monotherapy and adding other immunosuppressive drugs in often necessary (B) [95, 96]. How long should SAM patients receive immunosuppressive / immunomodulatory drugs after GC discontinuation? Literature review and analysis. There is no conclusive evidence to establish how long patients with SAM should receive treatment with immunosuppressive and/or immunomodulatory drugs following the discontinuation of GC therapy [97, 98]. Overall, studies show that after disease remission, drug doses can be reduced gradually. Initially, GC dose reduction is suggested and, subsequently, in the maintenance of clinical and laboratory parameters, a reduction in the doses of immunosuppressive/immunomodulatory drugs can be attempted. There is no predetermined treatment duration (B) [97, 98]. What is the evidence on the benefit of association vs. exchange immunosuppressive/immunomodulatory drugs in SAM? Literature review and analysis. Few comparative studies between immunosuppressive/immunomodulatory drugs support the prescription superiority of one medication over another, between monotherapies or combination treatments [3, 52–54, 66, 68–70, 99–105]. In a long-term follow-up, individuals who received MTX and combination of methotrexate and azathioprine showed an improvement in functional status beyond the need for lower doses of maintenance GC (B) [52, 53]. A randomized clinical trial did not verify the difference in muscle function tests in patients who had failed to obtain a clinical response with GC alone and who were randomized to treatment with cyclosporine, methotrexate or cyclosporine/methotrexate combination therapy (B) . Despite weak evidence, studies including a small number of patients have shown improvement in the evolution of extra-muscular disease, muscle strength and inflammatory markers in individuals who did not respond to conventional therapy and who used mycophenolate mofetil in monotherapy or in association (C) [70, 101]. Evidence points mainly to associated therapy for improvements in lung function tests in patients with SAM and ILD (C) [104, 105]. What is the role of rehabilitation, physical exercise and physiotherapy in the treatment of SAM? Literature review and analysis. Physical rehabilitation through physical exercises and physical therapy for muscle strengthening are beneficial and safe for patients with SAM when indicated two to three weeks after exacerbation of the disease, however this has not always been the guidance since, historically, these patients were discouraged from exercising because of the possibility of disease relapse or damage (B, D) [106–110]. There was evidence of improvement in aerobic capacity and isometric muscle strength without signs of increased inflammation among individuals randomized to exercise assessed by serum levels of CK (B)  (C) [112, 113]. Numerous studies have demonstrated the safety and positive results of supervised physical exercise in muscular function indicated for patients with SAM (B)  (A) . Moreover, physical exercise can prevent the process of muscle atrophy caused by inflammation, physical inactivity and treatment with GC (D) . In addition to improving muscle strength and increasing maximal oxygen uptake through resistance training, patient experienced the reduced expression of pro-inflammatory and pro-fibrotic genes, with significant positive impact on molecular profile and improvement in functional capacity (B) [115–119]. Evidence indicates that physical exercise has the potential to reduce disease activity in established cases of SAM and aerobic exercises may be more effective in reducing disease activity than strength and resistance exercises (B) [119–121]. How to monitor disease activity (biomarkers) in patients with SAM? Literature review and analysis. Levels of interleukin (IL)-6, IL-8, TNF and interferon gamma induced protein 10 (IP-10) can be used as biomarkers to monitor disease activity and pulmonary involvement (B) [122–125]. Several cytokines have been identified as a possible prognosis biomarker in SAM: TNF-related apoptosis-inducing ligand, IL-8, macrophage migration inhibitory factor, monocyte chemoattractant protein-1, leukemia inhibitory factor, IP-10 and interferon-α2 showed significant changes after treatment with methotrexate (B) [126, 127]. It was also verified that the loss of muscle strength was associated with changes in the serum levels of IL-8, IL-12 and stromal cell-derived factor 1 (B) . Additional results showed that changes in serum levels of cytokines (IL-6, IL-8 and TNFα) were positively correlated with changes in the evaluation of muscular strength and visual analogue scale regardless of treatment (B) . Levels of some biomarkers, such as TNF-α-activating factor B, were elevated in some subgroups of patients with SAM, especially those with active or positive anti-Jo-1 disease (B) . Elevated serum levels of the Krebs von den Lungen-6 are directly associated with pulmonary involvement with a manifestation of ILD, and these levels are inversely correlated to the variables studied through the pulmonary function test, which presents findings corresponding to a restrictive respiratory pattern (B) [129–131]. Other proposed biomarkers that are elevated in patients with active SAM, are represented by adipokines such as MRP8/14, galectin-9, TNF-type II receptor, CXCL10, and myositis-specific antibodies (B) [132–136]. Autoantibody titers demonstrated association with disease activity. A decrease in serum levels of anti-Mi-2, anti-Jo-1 and TIF-1 after treatment of SAM was detected in many cases (B) . High levels of serum ferritin was also found in patients with SAM and ILD, and evidence suggests that this may be used as a prognostic marker (B) . Of note, high serum levels of CK are the hallmark of muscle involvement . CK is released in the serum in case of muscle damage and is the most sensitive muscle enzyme in the acute phase of the disease. Moreover, elevation in serum aldolase, myoglobin, lactate dehydrogenase, aspartate aminotransferase and alanine aminotransferase also occur . Some patients have selectively increased serum levels of aldolase, which could be associated with syndromes including myopathies with discomfort and weakness, systemic disorders and pathology in perimysial muscle connective tissue (C) . How to define activity versus remission of SAM in clinical practice? Literature review and analysis. The IMACS has developed an assessment tool that provides appropriate clinical measures of disease status and which, together, assesses 6 items related to its activity. These items include overall evaluation of disease activity perceived by the patient and physician, accessed by an Likert scale or analogue visual scale; muscle strength assessed by MMT; muscle function measured by the Health Assessment Questionnaire Disability Index (HAQ-DI); and muscle enzyme sera and extra-muscular manifestations of the disease assessed by the Myositis Disease Activity Assessment Tool (MDAAT) (D) . In addition to the MDAAT, the IMACS defined the Myositis Damage Index (MDI) to included irreversible damage from the disease . To evaluate the cutaneous lesions of dermatomyositis, the IMACS developed the CDASI (Cutaneous Disease Activity Score), which assigns scores to active and chronic skin lesions . It is important to note that the IMACS used a consensus methodology to define the clinical response criteria, establishing as a complete clinical response a period of 6 months or more with no evidence of disease activity during treatment and definition for clinical remission as a period equal to or greater than 6 months of inactive disease in the absence of any therapy (D) . According to the IMACS, response to treatment is defined as an improvement of more than 30% in 3 IMACS items, excluding the MMT-8 . The IMACS’s assessment of response to treatment is therefore dichotomous, allowing us to state only whether or not there was improvement . Considering the need for sensitive response criteria at different levels of improvement, the recent ACR/EULAR initiative validated a tool. According to the score, improvement is defined as minimal, moderate or greater. This new assessment tool should be used in upcoming clinical studies evaluating new therapies for SAM . In addition to serum dosage of muscle enzymes, imaging techniques can identify changes in the muscle structure of SAM patients. Magnetic resonance imaging (MRI) has been used to evaluate disease activity, guide therapeutic decisions and select the biopsy site when necessary (B) . Patients with active disease may present areas of edema and muscular necrosis in T2-weighted images . In this same examination, areas of muscular atrophy, fatty degeneration, fibrosis and calcification can be evidenced in T1-weighted sequences (B)  (D) . It is important to emphasize that there is not yet a universally accepted standardization of the MRI protocol to be used. Robust data to guide the therapeutic process are scarce. Decision-making is based mainly on observational studies, many of which are retrospective in nature and include a small number of patients. Although not proven effective in controlled clinical trials, GC represents first-line drugs in the treatment of SAM. Intravenous immunoglobulin is considered in induction for refractory cases of SAM or when immunosuppressive drugs are contra-indicated. Consideration should be given to the early introduction of immunosuppressive drugs, especially azathioprine, methotrexate and cyclosporine, considering the association of these drugs and, in refractory cases, the use of rituximab. There is no specific period determined for the suspension of GC and immunosuppressive drugs when individually evaluating patients with SAM. A key component for treatment in an early rehabilitation program is the inclusion of strength-building and aerobic exercises, in addition to a rigorous evaluation of these activities for remission of disease and the education of the patient and his/her caregivers.